New Delhi: The recent acquittal of 16 Provincial Armed Constabulary (PAC) personnel accused in the 1987 Hashimpura massacre in which 40 Muslims were killed not only highlights an unprecedented delay and denial of justice, but also brings to the fore how a shabby and an indifferent investigation can derail even an open-and-shut case. The 216-page judgment, while sympathising with the victims, points out the culpability of the Uttar Pradesh probe agencies, which did not even adhere to the basic tenets of investigations to link the accused with crime. 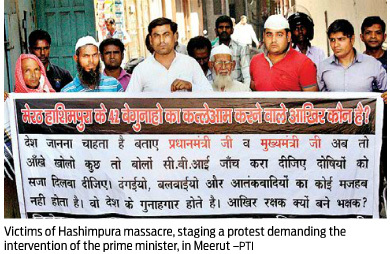 Unlike in 2002 Gujarat riots, where an alert civil society and investigating agencies did succeed in securing 400 convictions with proper protection of witnesses and presentation of circumstantial evidences, the trial in Hashimpura case despite having huge political ramifications started 15 years later in 2002, when the case was transferred to Delhi from Ghaziabad. No evidence was taken till 2006 when the charges were framed. The accused were also arrested several years after the incident, and the basis for their arrest was never explained, even though for major period the state was run by the Samajwadi Party or the Bahujan Samaj Party, both of which claim to be well-wishers of Muslims and vie for their votes. In a scathing comment on the investigating agencies, the court points out that since this is a case where the police officers probed their own colleagues, there should be no surprise that they conducted a shoddy investigation. Additional sessions judge in Tis Hazari court Sanjay Jindal observes that from the material evidence available on record, the prosecution had failed to identify the actual culprits and did not connect the accused facing trial with the alleged offence. “Apart from the absence of direct evidence against the accused persons, the circumstantial evidence produced by prosecution is also not sufficient to establish their identity as culprit,” the judgment said. The UP Police and its criminal investigation department neither sealed rifles used for killing persons, a basic requirement in an investigation, nor seized the truck employed to transport victims to Hindon and Upper Ganga canal. Seventeen rifles seized during investigation were examined at the FSL and compared with fired bullets but no conclusion could be reached due to want of sufficient characteristic marks. “No independent witness has been examined to prove the seizure of weapon or ammunition. No official record of issuance of arms and ammunition has been proved on record despite the fact that the offenders are members of armed forces. There is nothing on record to show that any of the above mentioned seventeen rifles were actually issued to the accused persons or they were having possession over the same on the relevant date and time,” the judgment recorded. The shabby investigation could be also judged from the fact that rifles were produced in unsealed conditions during trial. The judge noted that if so many bullets were allegedly fired then why not even a single empty cartridge has been recovered or proved on record. Further, no subsequent opinion was taken from the doctors concerned regarding the weapon of offence to make it a tight case. Also the judgment states that while there is no dispute about the incident which claimed 40 innocent lives, it is not clear as to on what basis the names of the accused persons were short listed. “Name of Subedar Surender Pal Singh has come on record as platoon commander but there is no other document or evidence to clarify the basis for including the other accused persons in the present case. But the court noted that it has been duly proved and established on record that several hundred persons belonging to different mohallas of Meerut city were apprehended or arrested by PAC and other forces from Hashimpura, out of which 40 to 45 persons belonging to Hashimpura were abducted in a yellow colour PAC truck by the constabulary officials. “It is also proved that those abducted persons were subsequently shot at and thrown into the waters of Gang Nahar in Murad Nagar and Hindon River in Ghaziabad. But it has not been proved beyond a reasonable doubt that the accused persons facing trial are the PAC officials who abducted and killed the people. Therefore, the accused persons cannot be convicted on the basis of scanty, unreliable and faulty investigation which has gaps and holes,” the court stated.